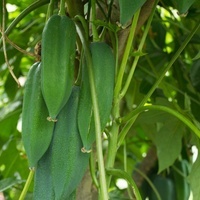 Babaco is a mountain papaya species originating in the highlands of Ecuador and Colombia and is believed to be a naturally occurring hybrid of Carica stipulate and Carica pubescens. 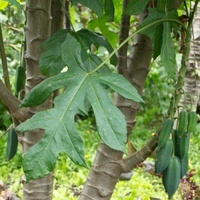 The plant is a small herbaceous shrub similar in appearance to other papaya species but only grows 1.5 to 3 m (5 to 10 ft) tall. 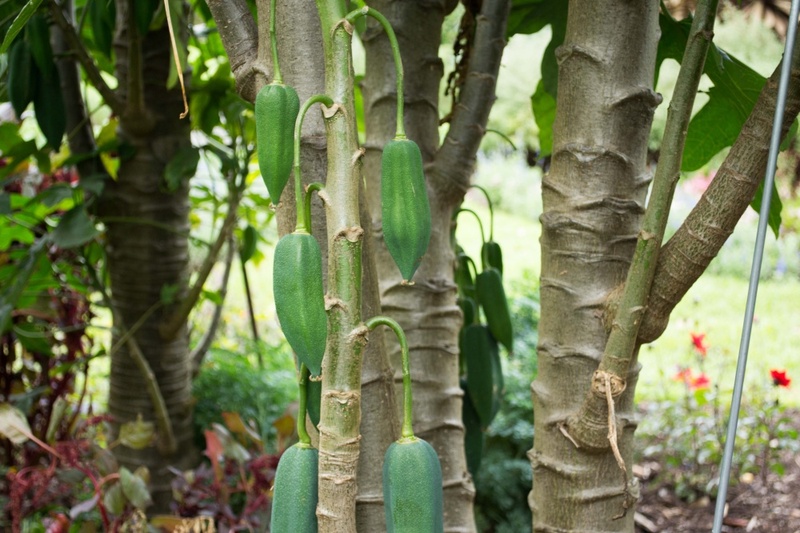 Much like papaya, it has an erect semi-woody or softwood trunk that is green when young, grey-brown when mature and is marked by leaf scars. 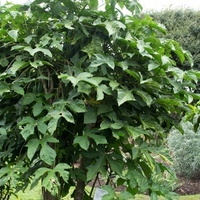 Generally, the thicker the trunk the more vigorous the plant and the more productive it is likely to be. It occasionally branches and shoots often appear around the base. Leaves very large, dark green, deeply lobed, prominently ribbed and veined, and attach to the trunk with a long hollow leaf-stalk. They are alternately arranged along the top half of the trunk and remain on the plant for four to six months before they die-back and fall to the ground. Flowers bell-shaped with five creamy-white petals, dark green sepals and borne in the leaf axis. They are all female but do not require pollination and bloom without seasonal influence about three months after planting. 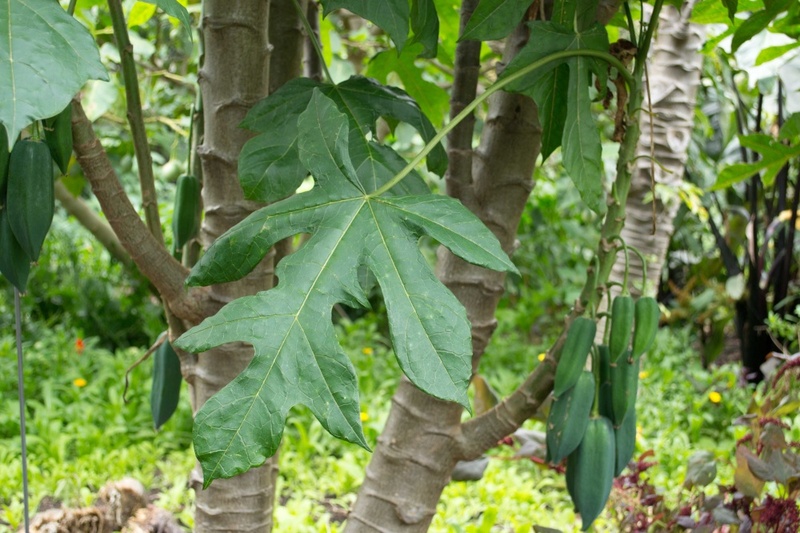 The flowers are followed by elongated, five-sided papaya-like fruit up to 30 cm (1 ft) long that usually weigh from 1 to 2 kg (2.2 to 4.4 lbs), but may be larger. They are green when young, becoming bright orange-yellow when ripe and ripen in progression from the lowest fruit to those higher up on the trunk. Being a hybrid and sterile plant, there are no seed produced. 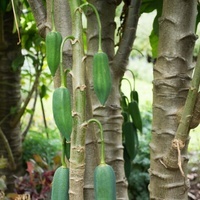 The fruit are fragrant and flavoursome, with a distinctly different aroma and taste to Papaya (Carica papaya). The pulp is creamy-white, juicy with a melting texture and with a pleasingly sub-acid to slightly acid flavour, likened to strawberry with a hint of pineapple. It is mostly eaten fresh out-of-hand and is easy to prepare because it is eaten with the skin on and there are no seed to remove. It can also be made into juice, dried fruit or jam. Grows naturally in sub-humid to humid subtropical and tropical highland climates, generally in frost-free areas with annual lows of 9 to 17 °C, annual highs of 20 to 29 °C, annual rainfall of 700 to 2000 mm and a dry season of 5 months or less. Babaco is also cultivated with irrigation in much drier areas, such as southern coastal California. New plants are started from cuttings because seed are not produced. 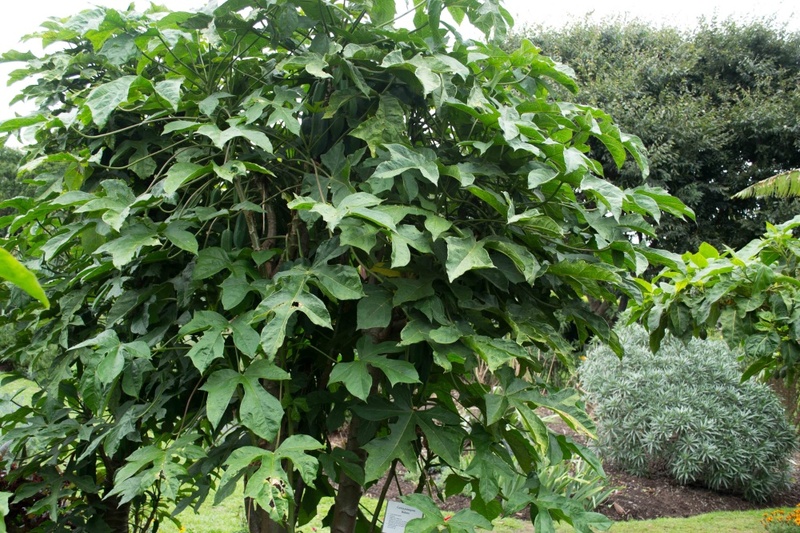 Cuttings are obtained by dividing the trunk of mature plants into slender sections around 30 cm (1 ft) long and 5 cm (2 in) in diameter. These are then dipped in a fungicide bath and the rooting end in a rooting hormone before being planted in a free-draining potting mix, where they usually strike roots within two to three months. Performs best on organically rich, well-drained loam and sand soils of a moderately acid to slightly alkaline nature, generally with a pH of 5.5 to 7.5 and on sites with full to partial sun exposure. Well tended plants start bearing fruit when about one year old and then continuously thereafter for two years, after-which they become unproductive and die, though they may be used before then for propagating cuttings. The fruit are harvested when they begin to turn from green to yellow and before they are fully ripe. When properly harvested and carefully packed, Babaco fruit remain in good condition for more than a month at 6 °C. The fruit does not oxidise (turn brown) over time. 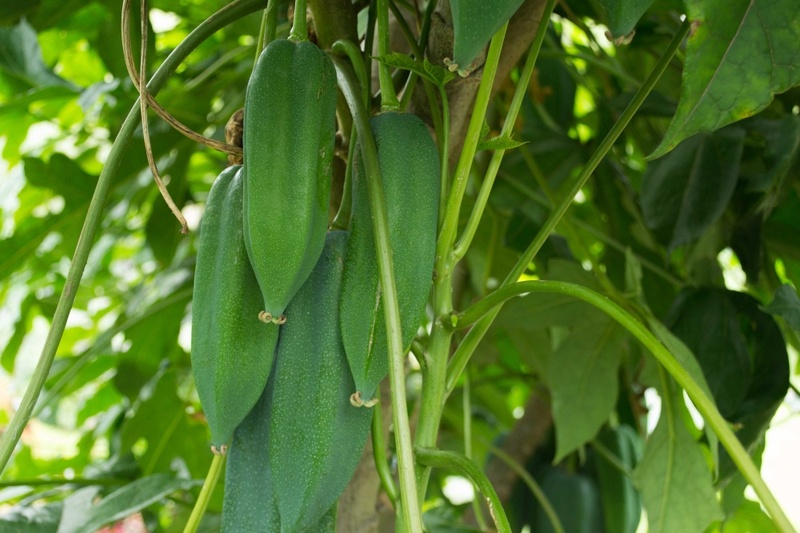 Yields are better than that of papaya and intensive cultivation has yielded up to 100,000 kgs to the hectare, with 40,000 to 60,000 kgs per hectare (35,680 to 53,500 lbs per acre) more usual. It has been grown commercially with varying degrees of success in Ecuador, Australia, New Zealand, France, Spain, Italy, California and Israel. It is recorded as having escaped cultivation and as naturalised on the Galapagos Islands, but there does not appear to be any record of it anywhere as a weed. National Research Council (Board on Science and Technology for International Development) 1989, Lost Crops of the Incas: Little-Known Plants of the Andes with Promise for Worldwide Cultivation, The National Academies Press, Washington D. C.